Love breakfast foods but get tired of making the same scrambled eggs and sausages? 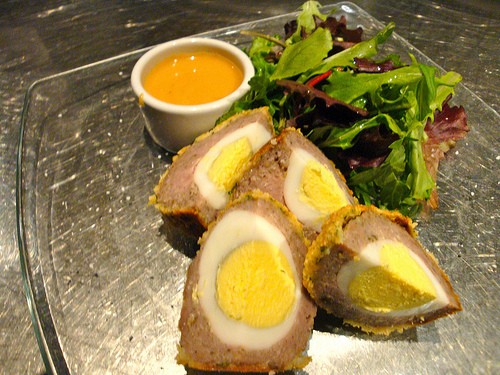 Try a Scotch egg. They’re easy to make and can be served with fruit or oven potatoes for a filling and simple meal. Never had a Scotch egg? Essentially, it’s a boiled egg wrapped in breakfast sausage and then breaded and deep fried. It’s easy to make gluten-free, and many people enjoy the eggs with mustard. Place four eggs in a saucepan and cover them with cold water. Place the pan on the stove and bring to a boil. As soon as the water boils, remove from heat and cover. Allow to sit off the heat for four minutes. Plunge eggs in a bowl of ice water. Refrigerate and allow to cool completely. Pat sausage into four thin patties. Place an egg in the center of each patty, and wrap patty around the egg, sealing carefully. In a small bowl, combine almond meal, thyme, pepper, salt, and mustard powder. Whisk two remaining eggs in a small bowl. Dip each sausage/egg ball into egg wash and then into the almond meal mixture. In a large pot, heat the duck fat over medium-high until it shimmers. Add the eggs and cook until browned on all sides, about four minutes per side. Put the eggs on the prepared baking sheet and transfer them to the preheated oven. Cook until sausage is cooked through, ten to 15 minutes more. These delicious burgers use grass-fed bison. You can make them gluten-free and dairy free, as well. I especially love the sauce on these burgers – it’s addictive. Fry shallots according to recipe below. Set aside to drain on paper towels. Form bison into patties and season with salt and pepper. While patties grill, toast buns, cook bacon, and prepare burger sauce. 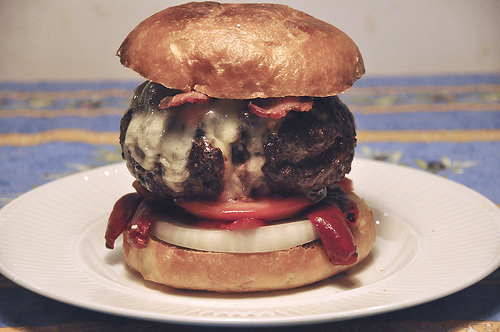 Top burgers with two half-slices of bacon, crumbled bleu cheese, and fried shallots. Spread buns with burger sauce. Heat 2 inches of peanut oil in a large dutch oven to 350 degrees. Place shallots in a small bowl and toss with flour, salt, and pepper. Add shallots to oil and fry until golden brown. Remove from oil with a slotted spoon and drain on paper towels. Looking for a little different burger to grill? Try these delicious lamb burgers with Mediterranean spices, herbed mayonnaise, feta cheese, pickled onions, and arugula. Place ground lamb in a large bowl. Add garlic, oregano, cumin, coriander, salt, pepper, and egg. Mix to combine thoroughly (I use my hands to do this in order to get it well combined). Form into six patties and grill on high heat, about four minutes per side until lamb has an internal temperature of about 145 (for medium rare) to 160 (medium). Allow lamb to rest while you prepare the mayonnaise and toast buns. Spread toasted buns with prepared mayonnaise. 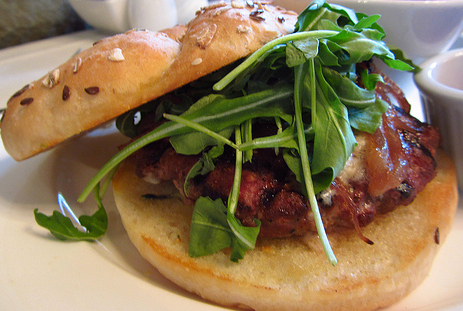 Top burger with pickled onions, arugula, and feta cheese. In a food processor, pulse garlic and oregano several times until well chopped. Scrape down sides of food processor. Add salt, egg yolks, and vinegar. Turn on food processor to blend. With food processor running continuously, add oil a few drops at a time to start, and then in a slow, steady stream until mayonnaise emulsifies. For gluten-free burgers, serve burger on a bed of rice or arugula topped with herbed mayonnaise and pickled onions. For dairy free, make sure you’re using a goat’s milk feta cheese or eliminate feta altogether. My family would probably tell you I’m obsessed with pickles. I. Love. Them. Every year I wait for cucumber season and watch for pickling cucumbers at the farmers’ market so I can enjoy homemade pickles. I like them garlicky with a touch of heat. 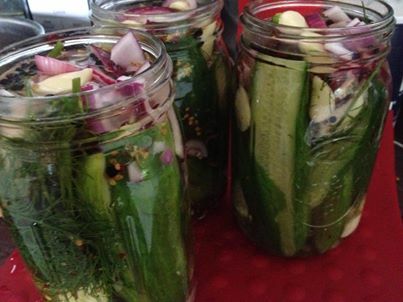 These refrigerator pickles are great because they are quick and require no canning. We go through pickles pretty quickly in our house, so I do them in 2 pound batches in a crock. Boil vinegar, water, and salt in a saucepan to dissolve salt. Layer cucumbers, onion, garlic, dill and peppercorns in a large crock. Pour hot brine over cucumbers. Add pepper flakes. Allow to sit, uncovered, on the counter until pickles are room temperature. Cover and refrigerate for three days before eating. I also like to do a quick pickle to red onions. It removes some of the bite from onions, and the result is delicious on burgers or salads. Tonight, I’m making a quick pickled onion to put on top of Mediterranean spiced lamb burgers. Combine sugar, salt, and vinegar in a small bowl and whisk until sugar and salt dissolves. Arrange red onions in a small bowl. Sit at room temperature for one hour.